Does it matter which one at this point? I often wonder if the public cares. "Just tell me how much", is what I hear. 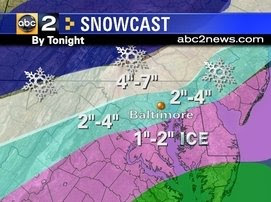 This map was my original forecast. Considering the morning band of snow that moved south, heavier snow may bust that forecast around the bay. Southern Maryland and Ocean City could pick up 1-2 inches this morning alone. The main storm will build in this afternoon and tonight. It looks colder, and that will delay the change to sleet and rain....but it will happen. That change over will occur from south to north late night and Wednesday morning.